The Premium Contact Form 7 & Mailchimp Integration plugin gives you the flexibility to easily grow your Mailchimp lists via the simple act of someone submitting your Contact Form 7 form. 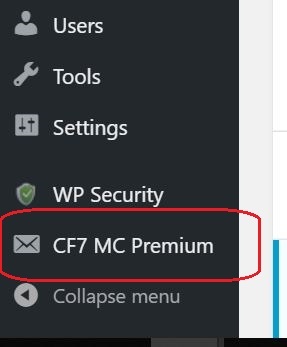 If you have a site which has one or more Contact Form 7 forms then you can harness the power of the integration of this plugin with the CF7 plugin to build your Mailchimp lists and increase the effectiveness of your web business or hobby. Ability to add subscribers easily to any Mailchimp list. Ability to add subscribers to one or multiple groups. (A group is also known as a list’s “interest”. Interests are grouped under “interest-categories”). 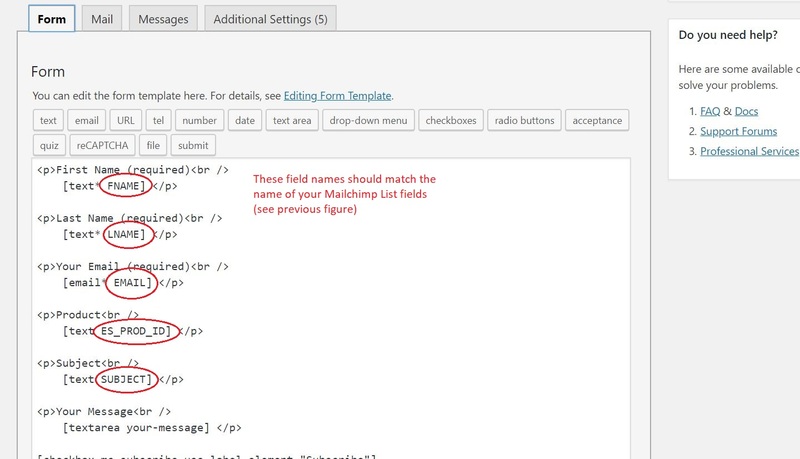 Create new merge tags for a list directly from your WordPress admin page. View your list’s groups and number of subscribers/unsubscribers per group. Step 1: Install and activate this plugin by uploading the zip file from your plugins menu. 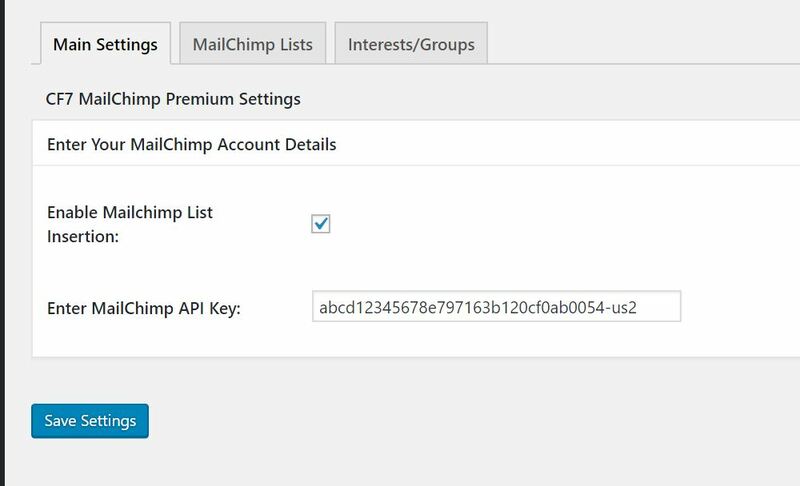 In the settings page, enable the checkbox and enter your Mailchimp account API Key. After you copy your API key paste it into the settings field as shown below. After you have configured the above settings click the “Save Settings” button. 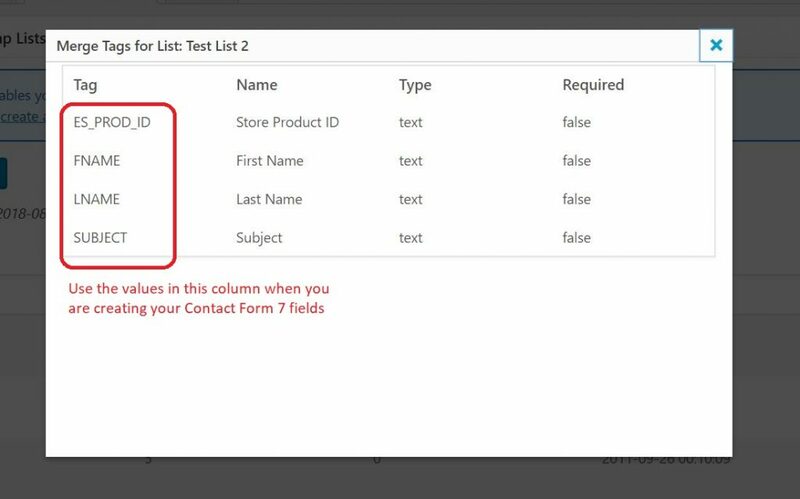 In order for the CF7 form to be able to submit more information than just an email address to your Mailchimp list you will need to first do some simple setup steps on your form so that it can submit the relevant information to your list. 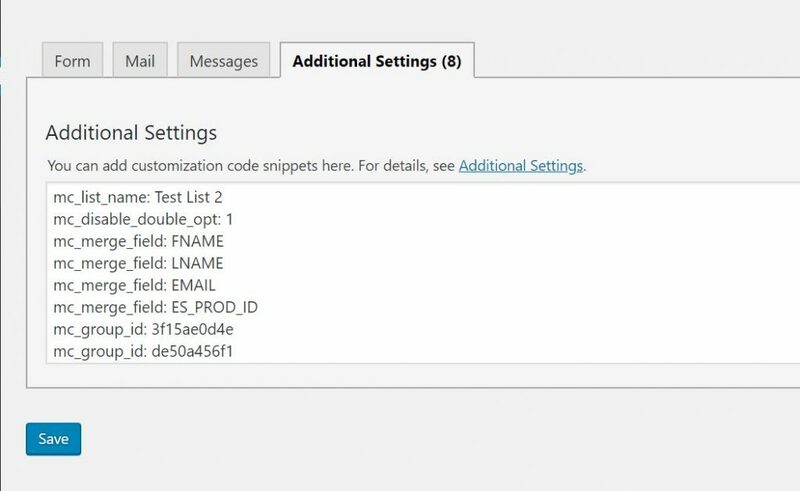 Normally you would have to log into your Mailchimp account to get the merge tags for your list but the premium plugin will get this information for you directly from Mailchimp. 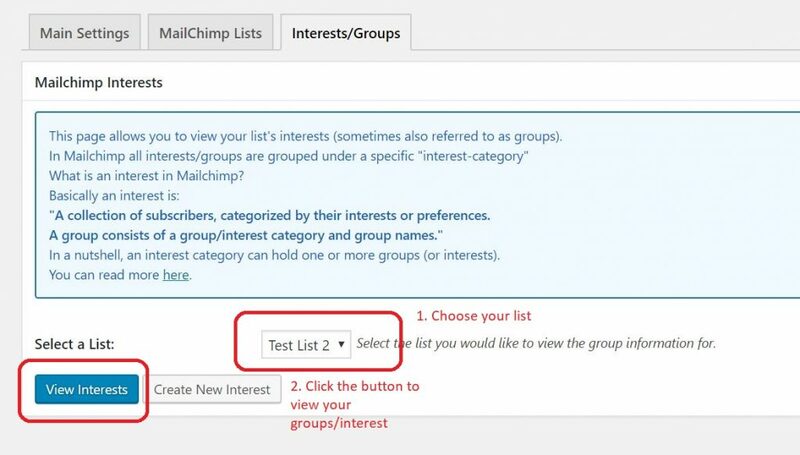 In this example we will be configuring the CF7 form to add subscribers to a specific Mailchimp list AND also to an interest/group within that list. After constructing your forms fields in the previous step, click on the “Additional Settings” tab of your form and add the configuration which will activate this form so that it can subscribe a visitor to your Mailchimp list. This line tells the plugin that you wish to subscribe whoever submits that form to the list which has the name “Test List 2”. (note: your list name will be different so make sure you enter the correct name which is case-sensitive). This line is the minimum config required in order to be able to subscribe someone to your list via the CF7 form. This configuration item will tell Mailchimp to NOT send an “opt-in” email to your subscribers. The above lines simply tell this plugin that you wish to submit the information entered into these fields from your form, to your Mailchimp list. You can add or delete as many “mc_merge_field” items as you wish depending on what sort of information you wish to collect in your list. 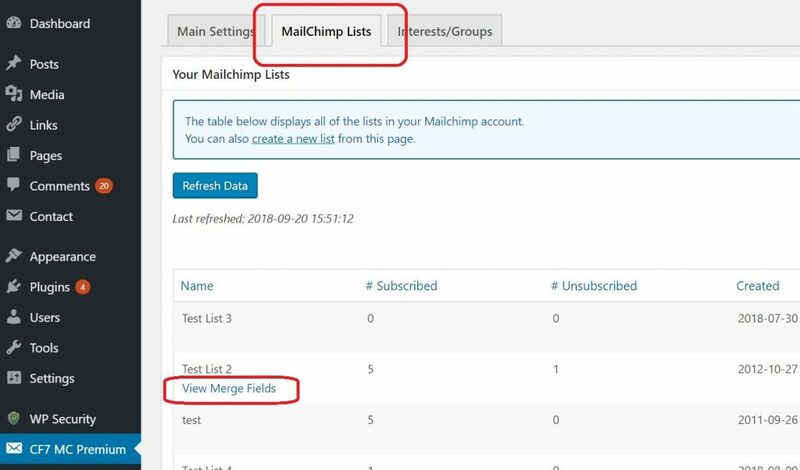 Just remember that these tag names must match the names in your form (see step 4) and also the List field names in your Mailchimp account for your list (see step 3). The above lines specify the groups that you wish to add your subscribers to. Notice that we are specifying 2 groups in this example which means that our subscribers will be added to both of these groups. You can specify one or multiple groups as long as they are within the same list. The above instructions demonstrate the basic way to use this plugin to help grow your Mailchimp lists via the Contact Form 7 plugin forms.